Technical developments in dental care continue bring tremendous benefits for our patients. At Florence Dental Care we are committed to providing the most state-of-the-art dental technology available. These advances enable us to diagnose conditions earlier, preview results, and provide effective treatments that maximize patient comfort. Your comfort is of paramount importance during treatment and we have multiple options to choose from. If your anxiety level is high, we can address it. One option, nitrous oxide/oxygen, is one of the safest sedatives in dentistry. It is well tolerated, has a rapid onset, is readily reversible and can be adjusted in concentration. The patient is fully conscious and capable of responding to a question or request. We also have other sedatives and anesthetics available. In addition, Sirius/XM radio can be tuned to your liking and we offer neck pillows and lavender eye bags. "We cater to cowards" and strive to make your visit as pleasant as possible. Dental restoration technology has advanced significantly in recent years yielding unprecedented convenience and economy for patients. Using advanced computer-aided design and manufacturing technologies, CEREC enables the dentists at Florence Dental Care to construct, produce, and insert individual ceramic restorations directly chairside in a single appointment. This capability eliminates the need for multiple appointments with lab work in between and is far more economical. CEREC can be used for crowns and the repair of most tooth decay with ceramic materials that are tooth-colored for an accurate match. For more information on CEREC, click through to our CEREC page. Florence Dental Care has state of the art 3D dental imaging capabilities providing the highest quality imaging available without increasing the radiation dose. The Sirona XG3D system makes possible full panoramic scans with brilliant, high-contrast and 3D images. The striking detail provided by this imaging saves patients time in both diagostic evaluation and surgical planning of implants. With more information available for discussing treatment alternatives, patients benefit from a better understanding of the need for treatment and outcomes can be predicted with more precision. State of the art dentistry requires state of the art information and Florence Dental Care has the ability to bring all of these benefits to our patients. Dental radiographs or X-rays, are an important part of a thorough examination. They can expose hidden tooth decay, reveal a tooth abscess, show impacted or extra teeth and help determine the condition of prior dental work. At Florence Dental Care we use the Dexis system for digital radiography which offers an 80 percent reduction in radiation, no need for film or processing chemicals and the production of a nearly instantaneously image. Our patients can readily see and understand conditions and recommended treatments, leading to more informed decisions and better results. Advances in video technology have made possible small cameras for dental imaging. With a camera about the size of a pen, we can record the mouth and present it as an image on a monitor that is magnified 10 – 40 times natural size. Intraoral cameras enable our patients to see exactly what the dentist sees and they are a tremendous aid in diagnosis and patient education. Advances in ultrasonic techniques now make it possible to remove calculus from teeth using an ultrasonic instrument. The instrument produces a soft ultrasonic vibration that increases the efficiency of calculus removal both above and below the gum line. This technique reduces the need for hand scaling of stubborn deposits and provides more comfortable access to the root surfaces. It is an important tool in the prevention and treatment of periodontal disease. Dental bonding lights are hand-held units that produce a light which triggers the setting and curing of dental materials. Composite resins are applied and sculpted in stages on the natural surface of the tooth. 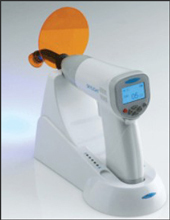 A high intensity curing light is then used to harden that layer of composite. The steps are repeated until the filling or composite veneer has reached its final shape. At Florence Dental Care, we use bonding lights to activate the setting of a wide range of dental materials to give patients effective, natural looking results. For more information about any of our advanced dental services, please call us at (413) 586-0320 or use our contact form if you prefer to email.